Responding to the Critics– Some of my favorite “Critics” A bit of levity! Be sure to read the first installment of this two part series, as we respond to Robert Kramer. Mr. Kramer affirms that in Matthew 24:30 “all the tribes of the earth will see him coming as He breaks through the clouds.” I will only address a couple of quick bullet points. First, Mr. Kramer, like most western thinking Bible students, and critics of Covenant Eschatology, takes it for granted that “all the tribes the earth” is referent to every human living on planet earth. This is really a subtle but fatal flaw in his claims against preterism. But, the claim ignores some critical linguistic issues– and Hebraic thought. First, is Jesus’ use of the word translated “tribes.” This is the Greek word phule, and is used just over 30 times in the NT. It is almost invariably a reference to the tribes of Israel. See my Who Is This Babylon? for a demonstration of this indisputable fact. The second assumption made by the adversaries of Covenant Eschatology, and that is without merit, is that “the earth” must be referent to the entire globe. This claim is one of the most common from the critics, yet, like the word phule, it ignores the way the word was used in the first century. The Greek word is “ge” and, interestingly, when coupled with “tribes” (phule” especially, it is suggestive that the reference is the “the land” i.e the land of Israel. So, what we are suggesting is that Mr. Kramer is not looking at Matthew 24:30 through the lens of audience relevance. He is ignoring the first century understanding of the words Jesus used. He is imposing a modern, 21st century cosmology onto the text. We will expose other false presuppositions by Mr. Kramer– and the critics of Covenant Eschatology– in our next installment. Be sure to get a copy of my Who Is This Babylon? for a fuller discussion of the issues addressed in this short article. You will find it fascinating and revealing! 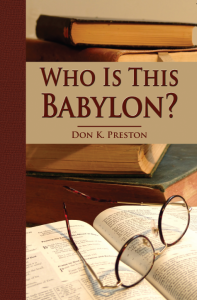 This book contains a powerful study of the issues addressed in this short article. Order your copy today! Next Next post: Responding to the Critics| A Response to Robert Kramer – #3– Will Jesus Come on the Clouds?